The official review into this year's Grand National is likely to be released next week. Two horses, Cheltenham Gold Cup winner Synchronised and According To Pete, died in the 14 April race at Aintree. It was the second year running there were two fatalities in the four-and-a-half mile contest. For those urging reform to the Grand National this is the key area. They would like to see the size of the field significantly reduced from 40 horses to a figure closer to 30. The logic is that this would reduce congestion, especially over the opening fences, and make the race safer. Others who support the National as it stands argue there is no evidence a smaller field means a safer race, and above all the authorities will be concerned the ''character'' of the contest is retained. In other words, the sheer scale of the race is what makes it different. If, as seems likely, the size of the field is retained at its current level it will deeply disappoint welfare groups who have supported the National but want significant alterations. Detailed research was undertaken in the build-up to the 2012 Grand National and some alterations were made to try to reduce risk, including some changes to fences. Becher's Brook remains a focus for the RSPCA in particular. Simply making the fences smaller is not a straightforward solution, if it speeds up the race it could actually make it more dangerous. Research is being undertaken, however, into the way the fences are built. Although they may stay the same in appearance, underneath the conifer branches the centre of the fences could be made more forgiving. If this reduces the number of fallers it would be welcomed by welfare groups. 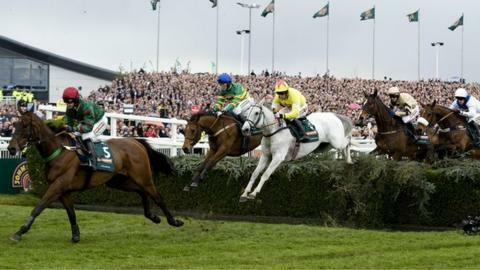 The start of the 2012 Grand National was chaotic. Synchronised unseated rider Tony McCoy on the way to the starting area and ran loose. Vets cleared him to run but the race was delayed, with false starts exacerbating the problems. The Gold Cup winner was later put down after suffering injuries during the race. The options for Aintree and the BHA are to alter either the procedure or the position of the start. The opening stages have been identified as the most dangerous in terms of fallers. Keeping the horse calm before they start is one way to help ensure they perform at their best. Throughout their deliberations Aintree and the BHA will have had to consider the emotional response to the 2012 Grand National, and they will be aware that their credibility does depend on the support of the RSPCA and World Horse Welfare. At the same time they will be wary of 'kneejerk' reactions, and at the heart of their approach will be the certainty that risk can never be removed from the Grand National. It is an essential ingredient in the race's character. As ever the question is how to reduce that risk, and it's a question that has never seemed so poignant.